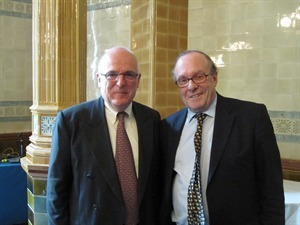 We were very privileged to end our summer events series with a lecture by Sir Richard Dearlove KCMG OBE, Master of Pembroke College, Cambridge and former Chief, British Secret Intelligence Service (MI6) on Tuesday 5th July. Sir Richard gave an incisive and thought-provoking lecture entitled ‘Ten Years After 9/11: What Are the Priorities for the Intelligence Service in 21st Century Britain?’ to a capacity audience at Global Strategy Forum. His remarks were on the record and were widely reported. To read the press coverage, click on the links below. To listen again to Sir Richard’s lecture, click here to download it.